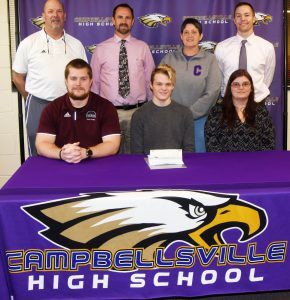 Campbellsville High School senior Joe Pipes will continue his academic and track career at Campbellsville University. 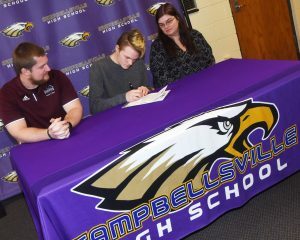 Pipes recently signed his letter of intent in a special ceremony with friends, family members, coaches and teachers. 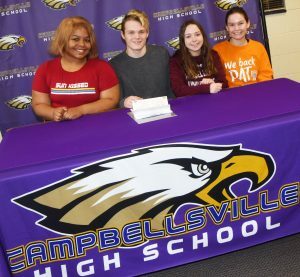 CHS Athletic Director Tim Davis said Pipes runs the 400- and 800-meter races for the Eagles, and has performed will throughout his track career. 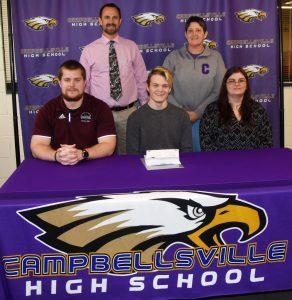 CHS Principal Weston Jones said it’s always exciting to see a student continue with academics and athletics at the next level. “Kudos to you, Joe, and all your hard work,” Jones said. 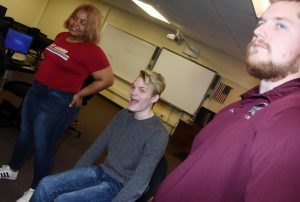 Though he has only been Pipe’s principal for a few months, Jones said, the two have had many conversations about his future. Jones said Pipes will certainly keep the CU coaches on their toes. 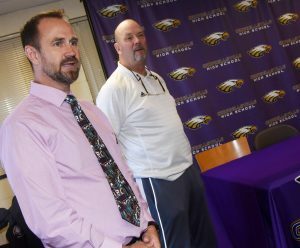 CHS track coach Steve Doss said he has enjoyed coaching Pipes, on the track and cross country teams, and this year in the pool. “What I found out with Joe is that he’s a natural athlete,” Doss said. Doss said Pipes has performed well this swim season, and has progressed very fast. “I knew the talent was there,” he said. Doss said Pipes is an integral part of the 4×400 and 4×800 relay teams for this upcoming season. 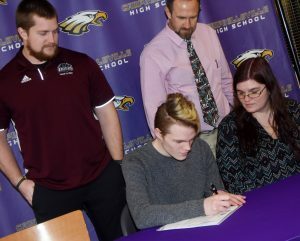 And when he begins training at the next level, Doss said, he knows Pipes will excel even more. “I have no doubt that he’ll hit records that he didn’t think were achievable,” Doss said. Pipes said he thanks his family members and friends for their support. He said he wants to attend CU because it’s close to home. Pipes said he isn’t sure what he will study at CU, but is considering psychology, law and criminal justice. He is the son of Amber and Gary Williams and Joe Pipes Sr.